The compressor - condenser units, manufactured by Company Mraz S. A. , are hermetic ones with air-cooled condensers. The units use R22, which is ozone harmless substance. 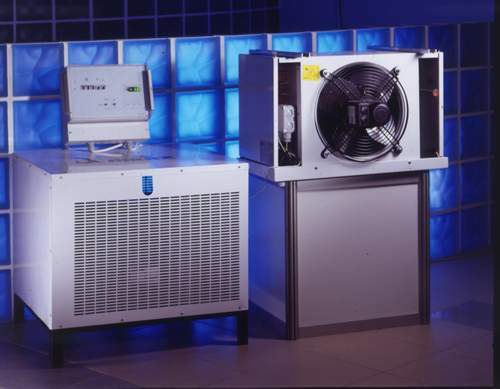 The air coolers are with high efficiency, manufactured by the Holland Company HELPMAN. They are produced from copper tubes and Aluminium blades with air forced circulation. The defrosting is by means of a heater. The control panel provides full automatic work of the units for the maintenance of a constant temperature in the chambers and automatic defrosting of the evaporators. The block - units from the family BAS are defrosted by air in the chamber, and the remaining ones - by means of heaters built in the evaporator. The automatics of the units includes: thermoregulating valve, thermostat, remote thermometer, solenoide valve, sight glass, filter - dryer, pressure control. The units are equipped with: copper tubes for assembly, cables, thermal insulation of the tubes ARMAFLEX and a set of elements for fixing of the product. The customers are provided with full technical documentation, incl. Refrigeration circuit diagram and el. Diagram.